Biography of English Portrait Artist. 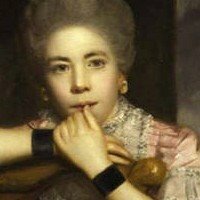 The great William Hogarth was already twenty-six years old, and an established engraver, when Joshua Reynolds (1723-92) was born, at Plympton Earle in Devon. 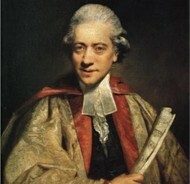 His father, the head master of the local grammar school, intended Reynolds at first for the medical profession, but from a very early age he showed so marked a talent for painting that at length recognizing the inevitable bent of his son's genius, he sent him to London at the age of seventeen to study under Thomas Hudson. In the next two years he painted portraits in the Plymouth district, but in 1744 he was back in London again, with an introduction from Hudson to the Artists' Club. But on the death of his father in 1746 he took a house for himself at Plymouth Dock, and found enough work in the neighbourhood to maintain himself and his two sisters for the next three years. It was during this time that he made the acquaintance of the portrait-painter William Gandy, whose example had a marked effect on his style, and encouraged the rich luscious handling of paint which became so marked a feature of his later work. Reynolds's genial temper and charming manners made him a welcome guest at the house of the Earl of Mount Edgcumbe, and won him popularity among the guests there. One of these guests was Admiral Keppel, the. Commander of the Mediterranean Squadron, and in 1749 he offered to take Reynolds to Italy in his own ship, the Centurion. The offer was naturally accepted, and this visit to Italy brought the first period of Reynolds's career to an end. While in Italy Reynolds did little original work, but he devoted himself to an assiduous and intelligent study of the great Italian masters, which modified his own work, developed his critical faculties, and enabled him to formulate those ideas upon art which later formed the basis of his 'Discourses'. Reynolds was twenty-six years old when he arrived in Italy full of enthusiasm for the old masters. His character was already completely formed, and as an artist he had already left far behind the dry manner and withering conventions of the popular portrait-painters. He had the docile temper of the student, which enabled him to profit by study of the works of others, but at the same time he had far too much intelligence to degenerate into a slavish imitator. To his thinking, Michelangelo, Raphael, and Annibale Carracci of Bologna were the great exemplars of what was then known as the "grand style" of painting. The Venetian colourists he relegated to a much lower plane, speaking of their work as merely ornamental and without appeal to the intellect or imagination. Of his three years in Italy he spent less than a year in Venice, and the greater part of the time in Rome, yet of all the artists of the Renaissance, it was the Venetians who left their mark upon his style. Reynolds' work seldom, if ever, recalls the severity and grandeur of Michelangelo, but its richness and warmth of colour, sumptuousness of arrangement, and lusciousness of pigment constantly remind one of the great masters of the Venetian Renaissance. In later life, the examples of Rubens, and especially of Rembrandt, further developed this tendency to rich glowing and golden colour-schemes, and an opulent texture of paint. Colour was his greatest natural gift, together with an instinct for harmonious arrangement. In form, to which he himself gave the premier position among artistic excellences, he was less gifted. Although he always endowed his figures with a feeling of weight, substance, and solidity, he showed little sensitiveness to refinement of form, and no delight in a subtle interplay of surface, while the limbs of his figures, especially the arms and hands, often show no sense of the underlying structure of bone. The method of study he adopted in Italy was not calculated to develop this sense of form, excellent though it was in other ways. He copied little, but made numerous studies in his sketch-book of composition, arrangement, and disposition of light and shade. This was characteristic of the intelligence he always brought to bear on his work. He realized that time spent in the manual labour of making complete copies would be less productive than time spent in thinking out the principles on which the works of the great masters were put together. Consequently, his studies are slight, but they are compact with thought, and when he returned to England in 1752 he was the most thoroughly educated English artist there had yet been. After three months in Devonshire, Reynolds finally settled in London. He was welcomed by his old teacher, Hudson, and his old patron, Lord Mount Edgcumbe. His portraits of Admiral Keppel and the beautiful Gunning sisters ensured his immediate success, and he speedily became the most popular painter in the town. From now till the end of his life he had no serious rivals except Gainsborough and Romney, and he was so fully occupied with commissions that he had little time for study to make good the deficiencies in his sense of form. The charm of his personality secured him a wide circle of cultured friends, and he became the centre of a brilliant group of men, all distinguished by rank or genius. In 1768 he was chosen as the first president of the newly formed Royal Academy, and in the following year he was knighted. Other honours followed; in 1773 the University of Oxford conferred on him the degree of D.C.L., and in the same year he was elected mayor of Plymouth. The last years of his life were clouded with misfortune. He had been deaf for many years, as well as short-sighted, and he became at length almost totally blind. His death came on 2nd February 1792, and he was buried in St. Paul's Cathedral close to the tomb of Sir Christopher Wren (1632-1723). Reynolds' aims and ideals in art are fully set out in the fifteen Discourses which he delivered to the members and art students of the Royal Academy. In the last of these, spoken as an old man already almost blind, he said that, if he could have his time over again he would devote himself exclusively to history painting, and to an attempt to emulate the art of Michelangelo. He was conscious that he had himself succumbed to the very temptations against which he had warned his hearers, and failed to give an example of the "grand style" of painting which he held up to others as the highest form of art. His enormous practice as a portrait-painter had given him little time for imaginative work, and ironically enough his few pictures of this kind do not show the great imagination which he himself recognized as the first essential of the "grand style". But the lofty ideals which he had pondered do give to his portraits a largeness, dignity, and distinction, and, in so far as they were applicable, he did attempt in his portraits to give expression to the principles of great art as he understood it. Joshua Reynolds was never content with a map of the face and a literal description of externals, but sought to fix on his canvas the permanent essentials of character in a large and dignified way. His effects of light and shade are always broad and simple, and he avoids a multiplicity of small lights which lead to pettiness of effect and distract attention from the being of the sitter. In defining the "grand style" he insists on the importance of generalization and the avoidance of the temporary, accidental, and individual. He was a man of far too acute intelligence to fall into the mistake of eliminating the particular and individual when painting the portrait of a particular individual, but he tried to present these particular and individual qualities in their most permanent and general aspect. His portraits have a kind of symbolical quality, and his characters are seen as types of an age and class rather than simply as individuals, in consequence his characterization is seldom intimate, and has none of the deep psychology of a Rembrandt. His sitters were mostly members of a wealthy and aristocratic class, many of them were persons of distinction as well as of rank and fashion, and it is as such that he paints them. The breadth of his handling, the opulence of his palette, the elimination of unnecessary detail, rich and harmonious composition, all contribute to this typical air of a leisured and distinguished world. Reynolds' oil painting shows many influences. In addition to Titian, Rubens, and Rembrandt already mentioned, Correggio and Parmigiano also left their mark upon his style, yet he never falls into the great vice of eclecticism which is insipidity. His designs and colour schemes have an inexhaustible variety, which Gainsborough envied, and which astonishes still. In his portraits of women it is beauty and a calm graciousness which impress us. He depicted them often in some mythological character of nymph or goddess in order to give universality and permanence to their beauty independent of the passing extravagances of fashion, yet perhaps he is happiest when he paints them in the costume of their own day as in the lovely and gracious "Nelly O'Brien" (Wallace Collection), or the austerely dignified "Lady Albemarle" (National Gallery London). Their untroubled eyes and the unconscious dignity of their carriage bespeak the assurance of rank and position even when the treatment is most informal. "Lady Cockburn" (National Gallery) garlanded with her children is a great lady, as well as a loving mother, and the "Three Graces" (National Gallery) garlanded with flowers are ladies of rank and fashion none the less. In his portraits of men he rarely, if ever, takes these liberties with costume, and the rich colours of eighteenth-century dress fit in naturally with the sumptuous colour-schemes he loved to create. But the sitter always dominates his clothes, which are kept subordinate to the general effect of the picture. Detail is summarily treated, and qualities of surface and texture not emphasized. By such means he achieved the generalized effect at which he aimed, but he never allowed himself to be led into a monotonous formula. Though they are controlled by an ordered science of composition, his designs and colour-schemes are as many as his sitters. The martial splendours of "Lord Heathfield" (National Gallery) contrast with the sober browns of "Dr. Johnson", or the blacks and greys of the "Two Gentlemen" (National Gallery), as much as the "Lady Cockburn" (National Gallery) differs from the "Nelly O'Brien" or "Mrs. Siddons as the Tragic Muse". His paintings of children, such as the "Age of Innocence", or the "Infant Samuel", have a grace and simplicity which show yet another aspect of his many-sided genius, and occasionally, in portraits of his friends, he even achieved the intimacy which is absent from most of his work. More than one of his portraits of Dr. Johnson show this rare aspect of him to perfection. It is strange that an artist who showed so much science in composition should have shown so little in the use of his colour pigments. To the chemistry of painting he seems to have been indifferent, with the result that many of his pictures are ruins of what they were. The bitumen which he used has cracked, and fugitive glazes have left under-paintings exposed, the oils in his pigment have yellowed and darkened, and though his colour is always mellow and rich, an added delicacy, which it must once have had, has vanished. One of the most famous painters of the 18th century, the importance of Reynolds in the development of English painting can scarcely be over-estimated, and his influence on his contemporaries and successors for fifty years or more was profound. The qualities of his work combined with his personal character and his position as President of the Royal Academy to give him a unique authority. His personal teaching survived in the Discourses, and his example raised the sorry business of professional portrait-painting from a trade to an art, and set a standard of vigorous and painter-like handling which found echoes in the work of nearly all the great English artists of his own and the next generation. It was the constant aim of his life to raise and dignify the position of the arts in England, and if we exclude William Hogarth he did more than any single man to found an English school of painting. Paintings by Joshua Reynolds hang in some of the best art museums in the world.  For more about British 18th century portraiture, see: Homepage.